In association with Liz Watts’ exhibition Festive Feast come along to a special Stoke-on-Trent edition of the hugely popular West Country-based reading series Words & Ears, hosted by Dawn Gorman. The evening will feature readings by a Stoke-on-Trent’s Poet Laureate Stephen Seabridge, newly-polished work written by poets at the ekphrastic poetry writing workshop at Valentine Clays on Saturday 1st December, poetry from Dawn Gorman and Liz Watts, PLUS open mic slots for anyone who would like to read their own work, bookable on the night. It is, above all things, a friendly, supportive space where established poets, new poets and all those in between can relax, perform, listen and network. Tickets are priced at £6 per person and include a free glass of wine. There will be a short break half way through the evening. Stephen Seabridge is the Poet Laureate of Stoke-on-Trent. He is the first to be appointed to this position for the city and his Laureateship term is 2018-2020. Stephen is born and bred in the city, having grown up, worked and studied in Stoke-on-Trent. Though he is averse to categorising his work too much, his poetry and art focuses on working class identity, boyhood and manhood, and how identity is tied irrevocably to place. 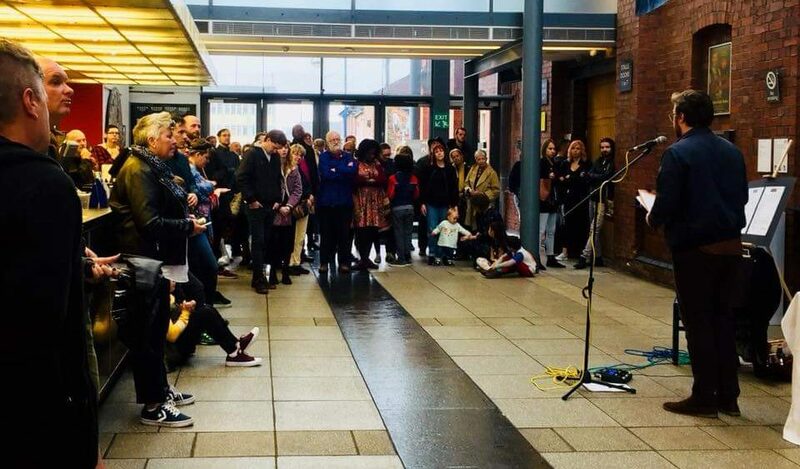 His latest works involve a series of commissions throughout the city, including a poem written in response to the recent 14-18 Now installation Weeping Window exhibited at Middleport Pottery and a series of poems written for the city-wide artistic heritage project DustRising. If you want to get in contact with Stephen, he is active on Twitter at: @S_Seabridge. He is also available via email at: stephenseabridge@outlook.com. “I felt so at home performing my poetry here – and really enjoyed spending the evening in such an atmospheric and beautiful environment listening to poetry inspired by workshops run by Liz’s resident poet Dawn Gorman.” Mel Woodend, open mic participant at the previous poetry performance event at Valentine Clays in April 2018.